A second cyclone within 48 hours has brought destructive winds and torrential rains to coastal regions of Australia, BBC reported. Cyclone Veronica lingered about 95km (60 miles) off the nation's north-west coast on Monday, officials said. 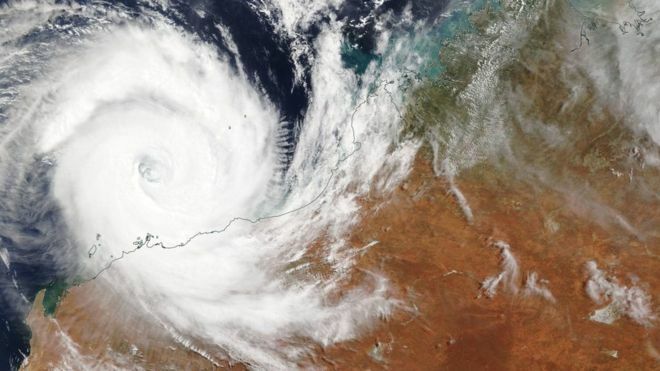 "It really is quite unusual for two cyclones to happen at the same time, particularly two very strong systems," meteorologist Steph Bond told the BBC, adding it had happened only twice in Australia's history. She attributed the timing to a climate phenomenon known as the Madden-Julian Oscillation creating "favourable" conditions for summer storms. Authorities said it had caused no major injuries or significant damage to infrastructure, following the region's biggest evacuation effort in nearly 50 years.